Last week I was a guest of honour at the 147th Founders Day celebrations of one of India’s oldest schools. 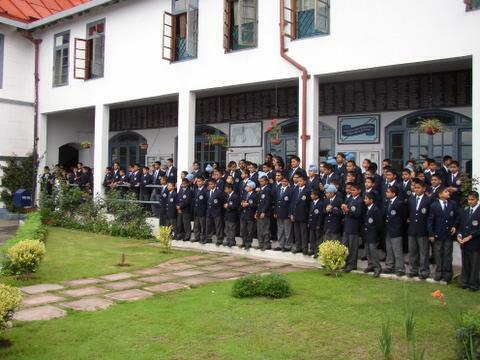 Bishop Cotton School, Shimla is a great school with a beautiful campus, spread over acres of land in what used to be the capital of the British Raj. The school has great traditions, and it was a pleasure to deliver the eighth Whitmarsh Knight Memorial lecture there. The following report that came out in The Tribune’s Himachal Plus supplement gives most of the details of the event. I have added photographs to give a better feel of the experience. Having spent their seminal years at the Bishop Cotton School (BCS), the Founders Day turned out to be a walk down the memory lane for old students who got together here last week to celebrate it in the typical Cottonian style. As the school celebrated its 147th Founders Day here, some of the old students came back to share their life’s experiences and how the learning at the school has held them in good stead throughout life. 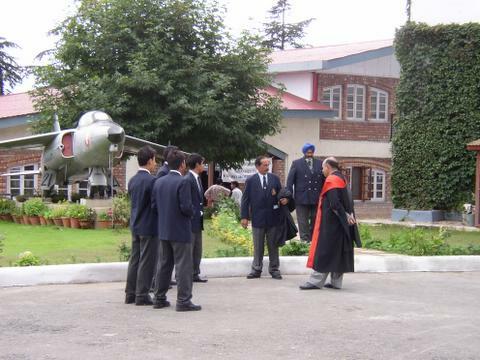 The day started with the NCC wing of the school, comprising of the three wings- army, air force and the navy according a guard of honour to Mr Mohanpal Singh Sidhu, an old student who passed out in 1957. 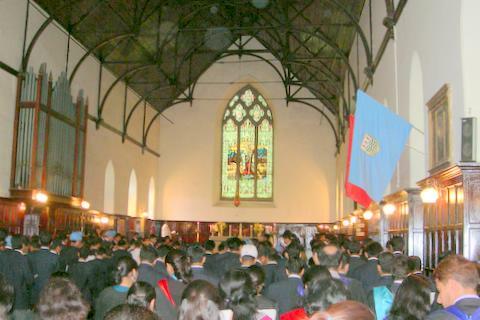 Following this was the Thanksgiving service at the Holy Trinity Chapel, attended by the principal Mr R.C. Robinson, teachers, students and old students. The guest of honour, Mr Sidhu, gave an invigorating message on the values of life to the congregation. An exhibition on environment, put up by students from six prominent schools of the town, evinced keen interest among all those present. The evening session began with the holding of the eighth Whitmarsh Knight Memorial lecture, held in the Irwin Hall. 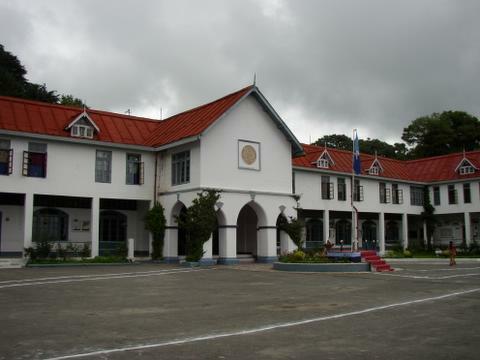 The lecture was instituted in 1999 by the Board of Governor of the School in honour of the Late Mr T.M. Whitmarsh Knight, who served at BCS from 1937 to 1953. The keynote address was delivered by Mr Roopinder Singh, Assistant Editor, The Tribune on the topic “The Youth of Today face an Unenviable Future”. He said no doubt there was excessive competition in today’s world and there was the feeling of lack of accomplishment, but at the same time there were unlimited opportunities. “It all depends on your approach and attitude towards life which will not just help in making you a successful person but will help you turn the disadvantage turn into advantage,” he said. The other illustrious speakers who spoke on the topic included Mrs Shanti Varma, former principal of Welhams School and Mr P.S. 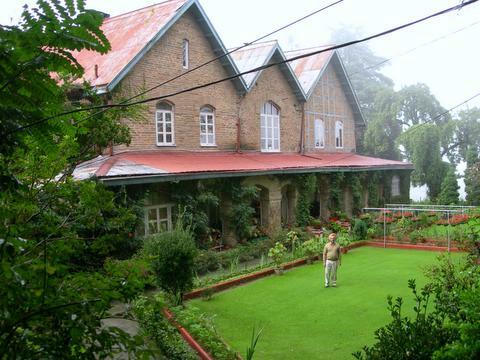 Kaul, Principal of the Tyndale Biscoe and Mallinson School, Srinagar. Both of them also happen to be members of the Board of Governors of the Bishop Cotton School. 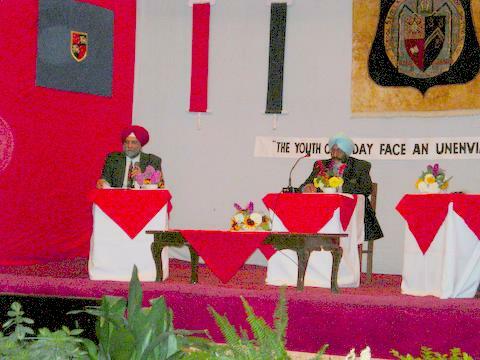 Mr H. Kishie Singh, a well-known motoring journalist who passed out from the school in 1955 was the moderator for the discussion. With the topic for the lecture being so relevant, the students came up with queries bothering them about their future. The Principal, Mr Robinson, too gave his opinion on the issue concerning every youth. Dr Rajwant Singh from Washington DC is visiting India these days. He has done singular work in promoting interfaith activities in the US and providing scholarships to needy students in India. 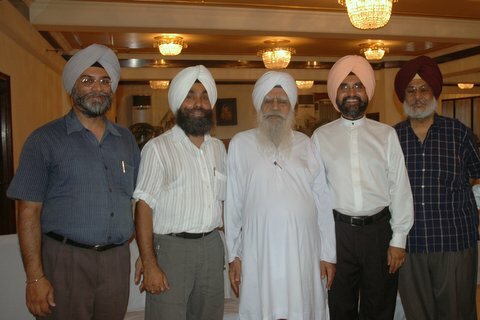 These pictures were taken on July 4, 2006, just before a reception in his honour at the Aroma Hotel in Chandigarh. 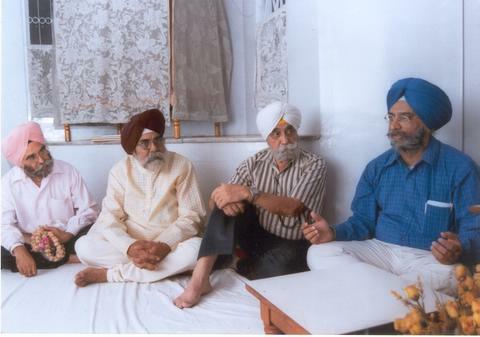 From Left: Roopinder Singh, R M Singh, Giani Gurdit Singh, Dr Rajwant Singh and Bhayee Sikandar Singh of Bagrian. Addressing English language teachers at a workshop organised by the University Grants Commission-Academic Staff College, Himachal Pradesh University, Shimla. 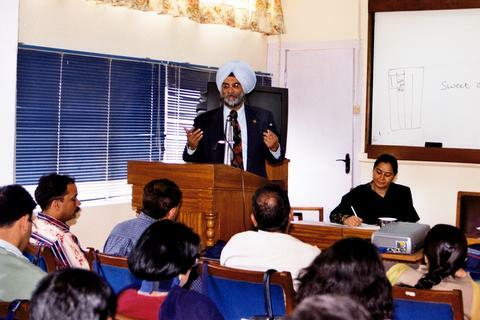 Roopinder Singh discussing Guru Nanak: His Life and Teachings at a function held at Sri Guru Singh Sabha, Ulsoor, Bangalore (India) on June 10, 2004. 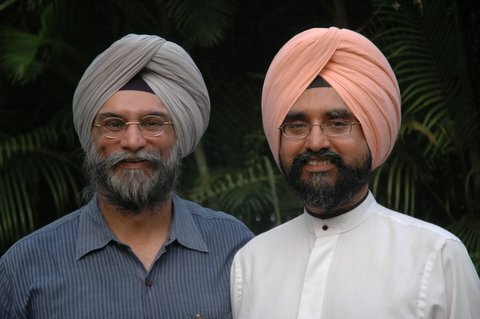 The author was later bestowed a siropa (a robe of honour) by the management of the biggest Gurdwara in Bangalore.